Calo Canine Therapy Department utilizes Golden retrievers to help students experientially live and learn the Calo model. Often, students will experience making mistakes with the canines and experience feelings of empathy, love, and acceptance as the canine quickly forgives and provides unconditional love. This allows the student to practice safe and healthy attachment, with the ultimate goal of transferring those relationship skills to safe human relationships (transferable attachment). 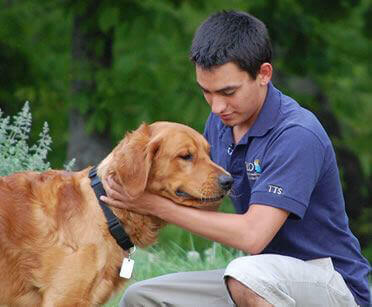 Students are automatically enrolled in the Canine Therapy Program upon admission to calo. All students interested in fostering and/or adopting a Calo canine will complete sequential requirements leading up to fostering and/or adopting a Calo canine. 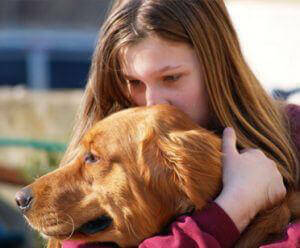 The following are ways that Canine Therapy helps students at Calo Teens. Parallel to the human foster/adoption process. This process is similar in many ways to the human foster/adoption experience and closely resembles the family services model many of our parents and/or students have experienced. Students will have the opportunity to choose be a foster parent for a canine and gain the valuable interpersonal and life lessons the canines offer. Some students will advance in the program to be eligible to adopt a canine and provide them with a forever home, encouraging a long-term relationship. On a smaller scale, this adoption process mirrors the adoption experience which families go through when adopting a child (application, essays, home study, placement, finalization, etc.). Students have the opportunity to experience caregiving of the canine where co-regulation in training facilitates the ability of the canine to eventually become self-regulated, same process by which the student develops. Typically, canines don’t respond well unless given clear communication and direction from a caregiver. As a result, students learn healthy ways to assert themselves and how they send and receive verbal and non-verbal messages. Further, canines quickly acclimate to the rhythm of a student and match his/her energy. Thus, canines provide feedback to students-when to be calm and in control when it is time to play. Studies have supported what has been observed at Calo; canines have a calming effect on humans by regulating blood pressure and heart rate. This type of regulation leads students to turn to the Canine for comfort and companionship when having a difficult time emotionally. Additionally, golden retrievers provide safe touch through playful and loving acceptance. The primary purpose of the canine therapy program is to empower students to experience Interdependence – healthy, affectionate, reciprocal relationships. Canines accomplish this through their instinctive ability to provide unconditional acceptance. When students experience this unconditional acceptance, it provides a unique opportunity for the adolescent to feel safe enough to practice healthy attachment with safe others. When students make mistakes with the canines, much like parents make mistakes with their children, the golden retriever is able to repair with the student. This ability to repair allows the student to experience emotions of regret, remorse, and empathy which were previously too difficult. Students who have been abandoned, neglected, inappropriately touched, abused, or never had the calming physical closeness they deserved earlier in life, find safety in experiencing this safe touch through these amazing animals. Most importantly, repetitive experiences of connection-break-repair, and healthy give and take relationship, increases a student’s self-worth. As a result, the student is better prepared to experience their emotional difficulties knowing they are loved and valued. Empathy is experienced by the students as they struggle through the adoption journey and recognize the journey their own adoptive parents experienced in welcoming them as a child in their family. All Calo students will have the opportunity to connect with the canines and learn to invest in their physical and emotional needs. "Since Josh’s enrollment at Calo, I have seen the canine program being an important and effective part of Josh’s therapy. I think that Josh has the ability to attach to and care for a dog. I know that Josh looks forward to adopting his own dog and will love and care for it. We will also welcome the dog into the family here at the house when Josh would come home."